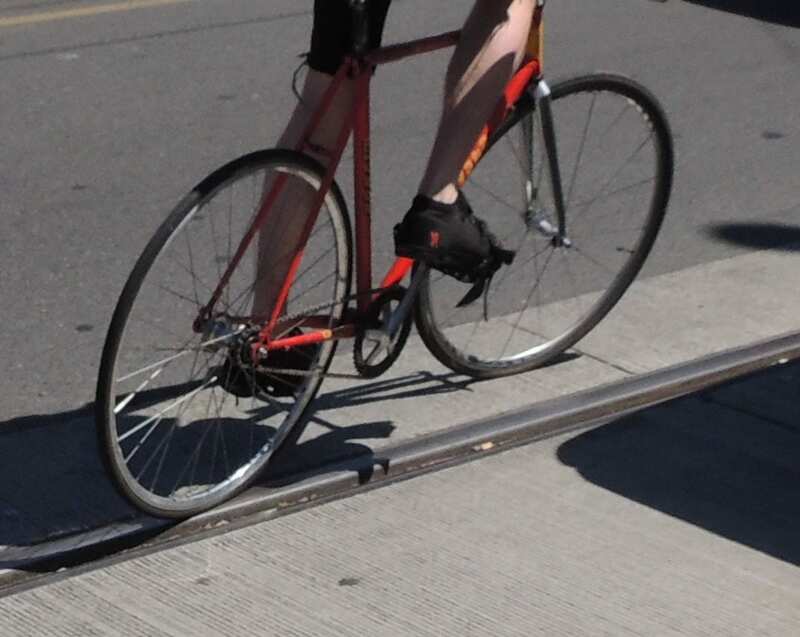 Pesky street-embedded rail tracks, especially wet ones, are a perennial hazard for bicyclists. But it hasn’t deterred many from riding up and down and in between the tracks of Broadway’s under-construction First Hill Streetcar. Constructing the separated Broadway Bikeway ahead of the tracks would have meant closing one lane of traffic, something Byers said the city didn’t want. According to Byers, the protected cycle track is scheduled to open in mid-October north of Madison. The section south of Madison is slated to open by the end of December. Riding the rails on Broadway. Byers said she is aware of at least three bicyclists who have wiped out on the Broadway tracks. Of course, as Byers points out, they shouldn’t have been riding there in the first place since SDOT closed Broadway to bicycles when streetcar construction started. Detour signs rerouting bicyclists to 12th Ave should be posted on all streets leading into Broadway for the duration of the tracks. Here’s SDOT’s site for more on what cyclists can expect on Broadway during construction. 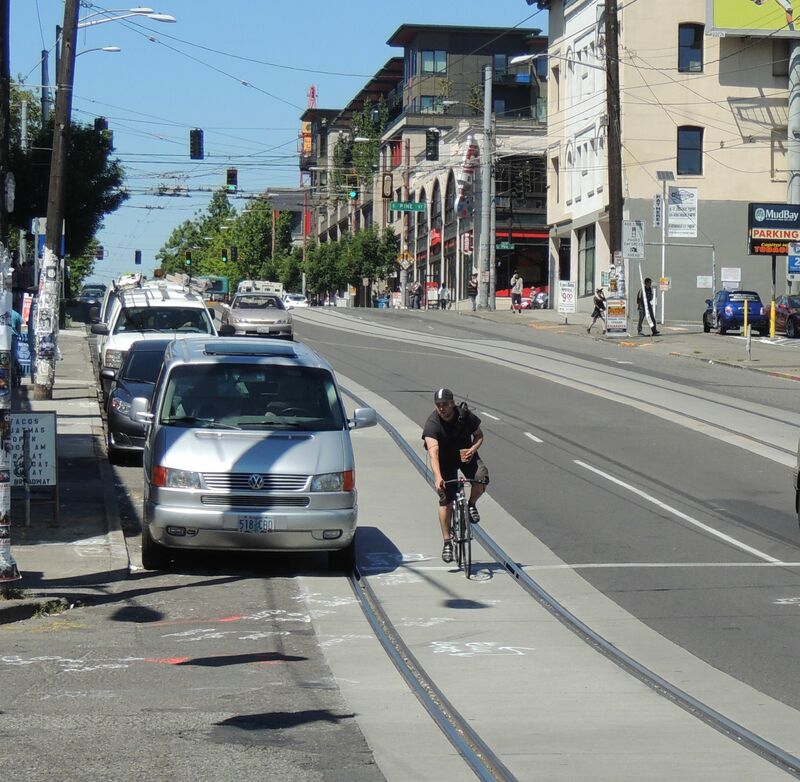 If you do happen to be biking on Broadway, look out for spots where the tracks move in towards the curb squeezing you across the rails, like on the west side of the street near Seattle Central Community College. Bikeportland.org has posted some ideas about how to improve streetcar track safety. One way is to install rubber flanges inside the rails that depress when trains roll over, but allow bicycle tires to smoothly traverse the tracks. SDOT has said it is researching the “flangeway” solution. This entry was posted in News, etc. and tagged bikes by Bryan Cohen. Bookmark the permalink. There are a number of solutions for dealing with street rail flange ways. There is a german product known as VeloSTRAIL that was designed for bicycles that fills the flange way, depressing under the weight of the rail vehicle while otherwise keeping a flat surface. The best way to improve streetcar safety is to remove the streetcars and implement grade-separated transit. If are no rails, then it is impossible to wipe out on the rails. Also, I’m curious how Southbound bikers are going to be expected to cross over to the cycle track. How much more would it cost to grade-separate transit? The best way is a way that will work with what they are currently building. 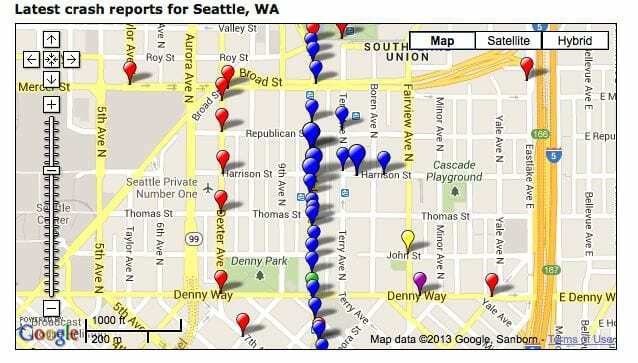 I love that you’re calling it a “Bikeway” and I hope SDOT adopts this terminology! Non-wonky people I talk to about “cycle tracks” at first think I’m talking about a velodrome or some other race-track type of thing. Bikeway is simple and perfectly compliments the new “greenway” term. Nice! Why do the streetcar tracks meander all over the street? My prediction: With vehicles and streetcars sharing the same (single) lane, and with streetcars blocking the flow of traffic when they stop to load passengers, there’s going to be a lot of backup and angry/impatient drivers, with subsequently more vehicle-related accidents. There probably will be a lot of angry drivers at first. Once they find alternate routes I think things will run more smoothly. That fellow isn’t wearing a helmet. He’s wearing a douchebag cap. I hope somebody informs him that a douchebag cap isn’t a substitute for a helmet. Parallel rail tracks are a hazard to all two wheel traffic. At least there is going to eventually be a bike lane. The design is not safe for scooters and motorcycle traffic. I already know of one scooter accident caused by the tracks :( Due to the weight/mass of these vehicles, these crashes tend to be much worse than bicycle wrecks. Of course, scooters and motorcycles can and will take the residential streets instead. I always feel a bit guilty driving with my loud pipes down these streets after 10 pm. Sorry folks. Broadway just isn’t safe anymore.